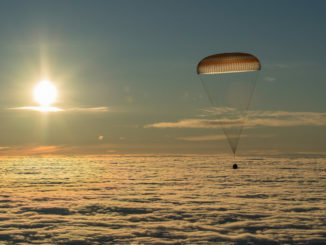 Bidding their crewmates farewell, a Russian cosmonaut and two NASA astronauts boarded their Soyuz ferry craft, undocked from the International Space Station and fell back to Earth Tuesday, landing safely on the snowy steppe of Kazakhstan to close out a 168-day mission. 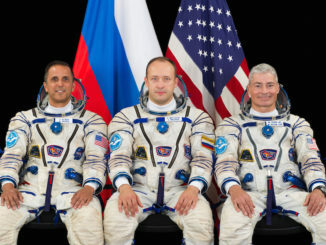 Two American astronauts and one Russian cosmonaut boarded their Soyuz MS-06 landing craft for a homecoming Tuesday night, U.S. time, concluding 168 days in orbit. The trio undocked from the International Space Station at 5:08 p.m. EST (2208 GMT), and landed on the snowy steppe of Kazakhstan at 9:31 p.m. EST (0231 GMT Wednesday). 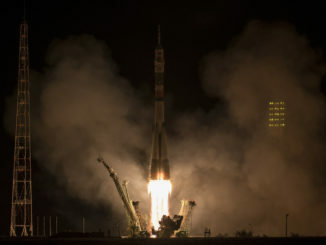 Lighting up the pre-dawn sky, a Soyuz rocket roared to life and streaked into orbit Tuesday carrying a Russian cosmonaut and two NASA astronauts to the International Space Station, boosting the lab’s crew back to six and the U.S. complement to four NASA-sponsored astronauts. Russian Soyuz commander Alexander Misurkin and two U.S. astronauts — flight engineers Mark Vande Hei and Joe Acaba — lifted off Tuesday from the Baikonur Cosmodrome in Kazakhstan. The trio began their six-hour journey to the International Space Station with a launch aboard a Soyuz rocket at 2117 GMT (5:17 p.m. EDT), and docking occurred at 0255 GMT (10:55 p.m. EDT). 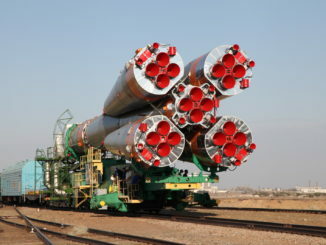 A Russian Soyuz booster arrived at its launch pad Sunday in Kazakhstan for two days of final countdown preparations ahead of liftoff with a Russian cosmonaut and two U.S. astronauts Tuesday on the way to the International Space Station. NASA has announced that veteran astronauts Joe Acaba and Ricky Arnold will launch on nearly six-month expeditions aboard the International Space Station starting in September and in March 2018, filling seats aboard Russian Soyuz spaceships recently acquired in a commercial arrangement with Boeing.